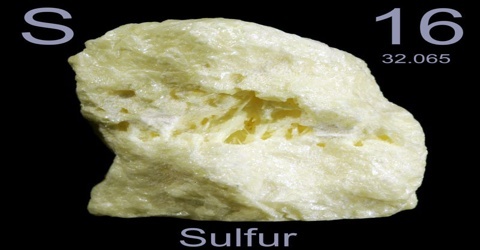 Sulfur is a pale-yellow, brittle nonmetallic element that occurs widely in nature, especially in volcanic deposits, minerals, natural gas, and petroleum. It is used in black gunpowder, rubber vulcanization, the manufacture of insecticides and pharmaceuticals, and in the preparation of sulfur compounds such as hydrogen sulfide and sulfuric acid. Its atomic number 16; atomic weight 32.066; melting point 115.21°C; boiling point 444.61°C; specific gravity at 20°C (rhombic) 2.07, (monoclinic) 2.00; valence 2, 4, 6. Sulfur is identified by the symbol S. An ion is a form of an element which has gained or lost electrons, changing the chemical structure and electrical charge of the element. Many sulfur compounds are odoriferous, and the smells of odorized natural gas, skunk scent, grapefruit, and garlic are due to organosulfur compounds. Hydrogen sulfide gives the characteristic odor to rotting eggs and other biological processes. Sulfur is an essential element for all life, but almost always in the form of organosulfur compounds or metal sulfides. Three amino acids (cysteine, cystine, and methionine) and two vitamins (biotin and thiamine) are organosulfur compounds. The name originates from the Latin word ‘sulphurium’ and Middle English ‘sulfre’ or ‘swefl’ meaning “to burn yellow”. The ancient Latin name was a derivation of the Sanskit word ‘Sulvere’ meaning yellow. The ancient name for sulfur is Brimstone, which derives from the Old English word brynstan, from ‘brin’ meaning “to burn” and ‘stan’ meaning “stone”. Both the words Sulfur and Brimstone therefore translate to mean “to burn”. The element sulfur has been known from the earliest times, since it is widely distributed in nature and occurs in large quantities in the uncombined form, especially in the neighborhood of volcanoes. 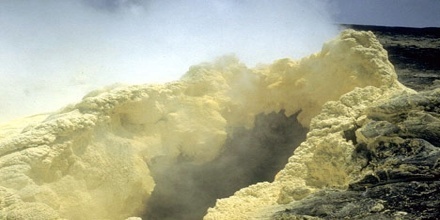 Sicily has long been famous for its sulfur mines, and smaller deposits are found in Italy, Iceland, Mexico, and especially in Louisiana, where it is mined extensively. In combination, sulfur occurs abundantly in the form of sulfides and sulfates. In smaller amounts it is found in a great variety of minerals, and it is a constituent of many animal and vegetable substances. 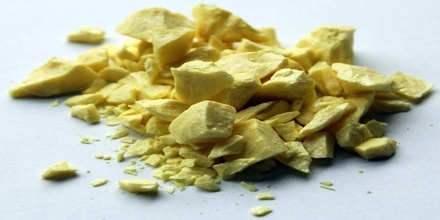 Today’s sulfur production is as a side product of other industrial processes such as oil refining; in these processes, sulfur often occurs as undesired or detrimental compounds that are extracted and converted to elemental sulfur. Throughout the 20th century this procedure produced elemental sulfur that required no further purification. Most of the allotropes of sulfur are crystalline in structure, although one is more plastic in nature. The most well known one appears in a yellow, odorless crystalline form which is also rather brittle. Many people are surprised to learn that sulfur is odorless; the rotten egg scent associated with this element is actually hydrogen sulfide, a dangerous sulfur compound. 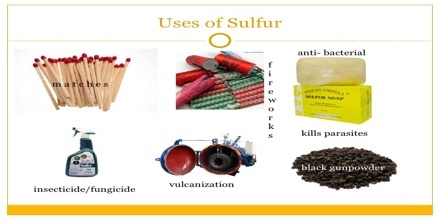 Sulfur is used in the vulcanisation of black rubber, as a fungicide and in black gunpowder. Most sulfur is, however, used in the production of sulfuric acid, which is perhaps the most important chemical manufactured by western civilisations. The most important of sulfuric acid’s many uses is in the manufacture of phosphoric acid, to make phosphates for fertilisers. One of the direct uses of sulfur is in vulcanization of rubber, where polysulfide chains crosslink organic polymers. Large quantities of sulfites are used to bleach paper and to preserve dried fruit. Many surfactants and detergents are sulfate derivatives. Calcium sulfate, gypsum, (CaSO4·2H2O) is mined on the scale of 100 million tonnes each year for use in Portland cement and fertilizers. Modern sulfur production is almost entirely from the various purification processes used to remove sulfur from natural gas, oil and tar sands. All living things contain sulfur and when the sulfur fossilised (as in fossil fuels) remains present. If unpurified fossil fuels are burnt, sulfur dioxide can enter the atmosphere, leading to acid rain. Reference: wisegeek.org, study.com, dictionary.com, wikipedia.